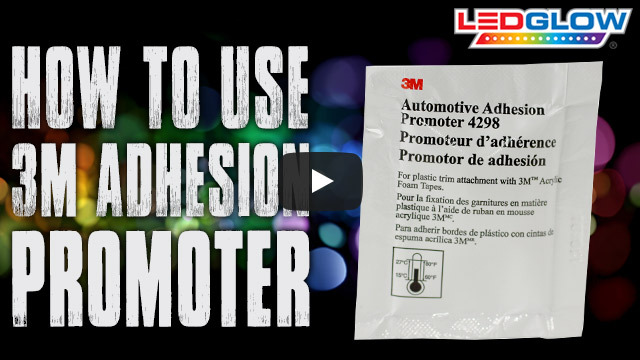 LEDGlow carries single packs of Adhesion Promoter, a liquid primer that reinforces the adhesion of Attachment Tapes to most low surface energy plastics. These plastics are often found in automotive instrument panel, interior trim and exterior trim parts. The promoter can be easily applied using the sponge which is included, and dries within 90 seconds. The surface must be dry and free of any contaminants at the time of application. LEDGlow stands by every one of its products with a one year limited warranty and free lifetime technical support. I would absolutely suggest you get this for installation. It makes a huge difference! Helps the 3M tape stick to the frame better when used.